The outgoing government of Alvaro Uribe in Colombia gave a shameful presentation before member states of the Organization of American States (OAS) on Thursday, reminiscent of Colin Powell’s “weapons of mass destruction” power point evidence presented in 2003 before the United Nations Security Council to justify the war in Iraq. Colombia alleged that Venezuela is harboring “terrorists” from the Armed Revolutionary Forces of Colombia (FARC) and the National Liberation Army (ELN) and hosting several “terrorist training camps” near the border region that divides the two nations. During an extraordinary session convened at OAS headquarters in Washington on Thursday, upon request of the Uribe government, Colombia’s ambassador to the OAS, Luis Alfonso Hoyos, presented television and video images allegedly taken from computers confiscated during the illegal invasion of Ecuatorian territory on March 1, 2008, which resulted in the death of FARC leader Raul Reyes and a dozen other Colombian, Ecuatorian and Mexican citizens. Hoyos also presented several computer-generated maps and photographs of alleged members of the FARC, which he said were taken inside Venezuela. Yet none of the images were authenticated or verified as reliable by any source other than the Colombian government. Colombia also used satellite map images, some from Google Earth, to show alleged “coordinates” where FARC members are in Venezuela. Furthermore, the photographs presented by Hoyos had no source identification, dates or times, and merely showed alleged members of the FARC and ELN in different jungle and coastal areas. Venezuela and Colombia share a porous, jungle and mountainous border and both countries have Caribbean coasts. The countries have similar vegetations, climates and scenery. Venezuela’s ambassador to the OAS, Roy Chaderton said the photographs looked to him as though they had been taken in Colombia. “That looks like the beach in Santa Marta to me”, responded Chaderton, after Hoyos claimed a photo of a FARC member drinking a beer on the beach was taken at Chichirivichi, a Venezuelan beach town. “There is no evidence, not a single piece of proof, of where those photographs were taken”, said Chaderton, adding that the “evidence” presented by Colombia was “confusing, imprecise and non-convincing”. The Venezuelan army verified and thoroughly inspected the locations and coordinates provided by the Uribe administration on Thursday and found none of the alleged “terrorist sites”, “camps” or “guerrilla presence” claimed by Colombia. Upon arriving at the first coordinate indicated in Colombia’s report, identified as an alleged terrorist camp of alias Ruben Zamora, the Venezuelan army found a farm growing plantains, yucca and corn. The second coordinate, which was the alleged camp of FARC commander Ivan Marquez, was merely an extensive field with no structures or presence of anyone or anything. During his two-hour long flamboyant presentation, Hoyos called for “international intervention” in Venezuela to verify the campsites and gave Venezuela a “30-day ultimatum”. “Colombia requests a commission of international members, including all those of the OAS, go to Venezuela and verify each of the terrorist camp sites and coordinates to see the truth”, said Hoyos, adding, “we give the Venezuelan government 30 days”, although he didn’t specify what could happen afterward. Hoyos also accused the Venezuelan government of facilitating drug trafficking, money laundering, illegal arms trade, attacks against Colombian armed forces and even went so far as to allege the Chavez government “squashes its opposition”, “represses freedom of expression”, “insults other governments” and “violates principles of democracy”. At the same time, Hoyos said his government would be unwilling to listen to or respond to any accusations, insults or offenses made by the Venezuelan government. Colombia’s position is an echo of Washington’s, which has accused Venezuela of harboring and providing refuge to members of the FARC during the past seven years. But, the US government has also failed to present any evidence to back such claims, and often makes contradictory statements, which appear to confirm the lack of solid proof. In March 2010, US Southern Command (SOUTHCOM) chief General Douglas Fraser said that he had seen no evidence of any links between Venezuela and the FARC. “We have not seen any connections specifically that I can verify where there has been a direct government-to-terrorist connection”, declared Fraser during a hearing before the US Senate Armed Forces Committee. However, the following day, General Fraser contradicted himself before the press, stating, “There is indeed clear and documented historical and ongoing evidence of the linkages between the Government of Venezuela and the FARC”. Possibly, Fraser was referring to previous governments in Venezuela, such as those of Carlos Andres Perez (1989-1993) or Rafael Caldera (1994-1998), which actually housed an office of the FARC in the presidential palace. President Chavez shut down that office when he entered the presidency in early 1999. Or maybe General Fraser was referring to the specific requests made by two Colombian presidents, Andres Pastrana and Alvaro Uribe, for Chavez to mediate the release of hostages held by the FARC. 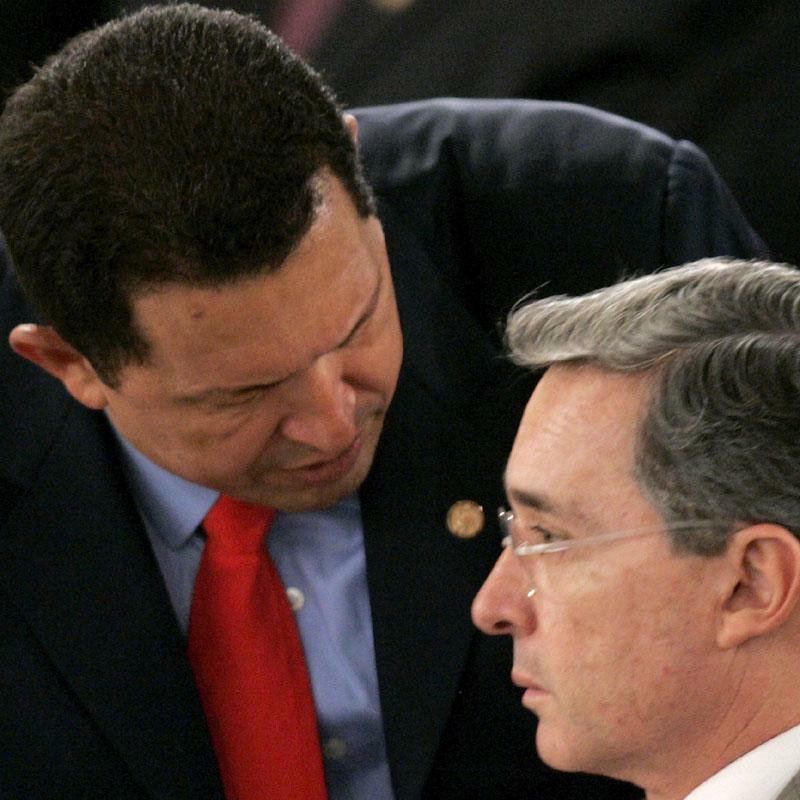 With full disclosure and complete authority from President Alvaro Uribe, and based on his own personal request, in September 2007, President Chavez accepted the role as mediator in order to secure the release of several hostages held by the FARC inside Colombian territory. For that reason only, Chavez met with FARC commander Ivan Marquez and assured the release of Clara Rojas and Consuelo Gonzalez in January 2008. But otherwise, the Venezuelan government has consistently and repeatedly denied any links or support given to the FARC or any other armed, irregular group from Colombia or elsewhere. After Colombia’s presentation before the OAS, President Chavez announced a complete rupture in relations. “It is with tears in my heart that I announce that we will break all relations with Colombia. We have no other choice, for our dignity and our sovereignty”. Chavez also ordered troops to secure all border areas. “I have ordered a maximum alert on our borders. Uribe is a mafioso and a liar, and is capable of anything”, he said, recalling how Uribe ordered the invasion of Ecuador’s territory in 2008 and then lied to President Rafael Correa about what had happened. Venezuela accused Colombia of failing to resolve its own internal conflicts, including a 60-year old civil war that has negatively impacted its neighbors with violence and drug trafficking spilling over the borders. More than 4 million Colombians, fleeing the violence in their country, live in Venezuela today. The Colombian “show” appears to be an effort to justify preemptive war against Venezuela. Last year Colombia opened its territory to seven US military bases in an agreement that the US Air Force claimed was necessary in order to conduct “full spectrum military operations” throughout South America to “combat the constant threat of anti-American governments in the region”. Loox like the imperialists are setting up the entire Planet for a perfect storm: WWIII.